If you are a music lover who owns an iPhone, you must be aware that you can rarely download songs on your iPhone for free. You have to spend a lot of money to download those songs. And as a music lover, your playlist might cost more than a hundred dollars. So it is no wonder you’d want to keep your playlist safe and secure. It is common to fear losing something that you’ve put in an incredible amount of time and money in. And no doubt a music lover would be absolutely devastated if they lost their playlist. It would be as if they lost their beloved pet. But fear not because there exist easy solutions. You can always backup iPhone songs to iTunes! So even if you do end up mistakenly deleting data or losing your iPhone, trust iTunes to have your back. One solution exists to help backup iPhone songs to iTunes is the iMyFone TunesMate. It helps you to transfer media files from your iPhone to your computer or iTunes easily. You will find that there will be no restrictions while transferring files. It gets rid of all ITune’s limitations and errors and the chances of you losing your data is a minimum. This tool helps you transfer files from an iOS to iTunes and vice versa and from an iOS to a computer and vice versa. 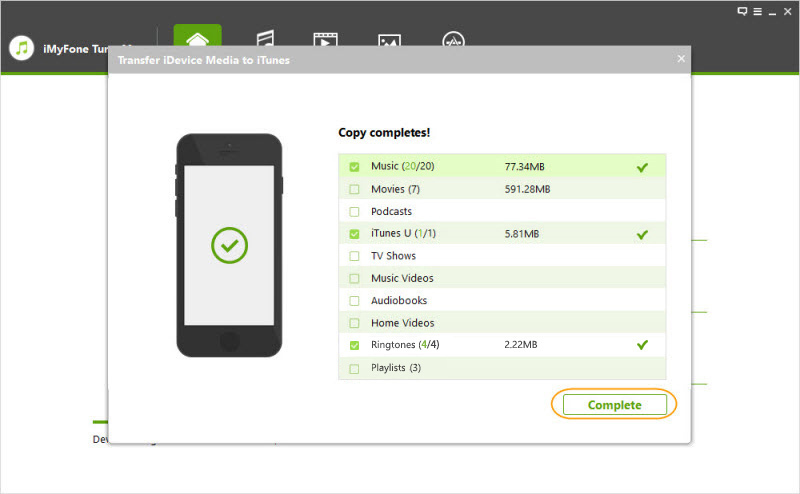 Files which are paid for as well as those which are free are supported by iMyFone TunesMate. You are able to preview your files and sync them selectively. Data can be synced without losing previous data using this app. Install and launch iMyFone TunesMate on your computer. Connect your iPhone to the computer using an Apple USB cable. Click on “Transfer iDevice Media to iTunes” and then click “Start”. The media files on your device will then be scanned and listed on the screen. Tick the “Music” button and then click “Start” to start the transferring process. When the transfer is complete, click on the “Complete” button. Install and launch iMyFone TunesMate on your computer. Connect your iPhone device to the computer using an Apple USB cable. Then check the music files which you want to transfer to iTunes. After you’ve checked the favoured music files, select “Export > Export to iTunes”. Your files will be transferred to iTunes. Step 1. Using iTunes, when connected to the internet, any apple device you own which you want to be backed-up can be synced. Syncing is the process by which information is shared between devices. Step 2. Install the latest version of iTunes on your computer. Step 3. Use an Apple USB cable to connect your device to your computer. Step 4. Find your iPhone device on iTunes and then click on it. Step 5. Click the “Summary” tab. You’ll find the option to “Sync with this iPhone over Wi-Fi” which you’ll have to click. Step 6. After the above steps are done, click “Apply” and remove your USB cable from your PC. Step 7. Choose the media that you want to be synced and click “Sync”. Step 8. Always make sure that your iPhone device and iTunes are connected to the same Wi-Fi connection. Otherwise the sync will be impossible to do. However do keep in mind that the iTunes app has some limitations. It may sometimes not accept certain media files of a different format. The steps and ways mentioned to use iMyFone TunesMate to keep your iPhone songs backed up should help keep your mind at ease. Now you wont have to worry about losing your music because youll always have a secure copy of them stashed in your iTunes! So purchase iMyFone TunesMate today and get rid of your worries.